The Badlands (South Dakota) - This national park consists of nearly 244,000 acres of some of the most bizarre landforms I have ever seen. Here, rivers and rainstorms have been eroding away the soft sediments and volcanic ash, revealing colorful bands that correspond with specific time periods in the history of the rock formation. Wind Cave (South Dakota) - First explored by a 16 year old boy with a candle and a string, Wind Cave now has over 100 miles of known passageways, although studies indicate only about 5% of the cave has been discovered. The most fascinating part of the cave is its entrance. The Lakota Indians have been long aware of this opening, and regard it as a sacred place. 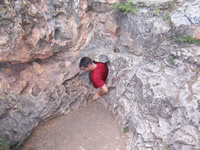 In the picture to the left, you can see a guy attempting to enter the natural entrance of the cave. (I guess he didn't care about the gate park rangers have installed to stop people from doing just that....) It is this opening (and not the cave's interior) that gives Wind Cave its name. The wind moves depending on atmospheric pressure on the surface and inside the cave. When the pressure is higher outside than inside the cave, wind rushes into the entrances; when pressure is higher inside the cave, the wind blows out of the entrances. This was confirmed on our visit by the presence of ominous clouds in the distance (storm approaching) and the strong winds blowing out of the natural entrance. Mammoth Site (South Dakota) - More than 26,000 years ago, many large Colombian and woolly mammoths spent their time tediously scraping away the snow with their tusks to find food. However, scientists believe some mammoths were "lazy" and were instead lured by the more easily-accessible vegetation at the sinkhole's edge. Once these mammoths risked coming near the sinkhole's edge, it is believed they fell in, became trapped and died. Scientists have found remains of 52 mammoths in the pit (which was discovered by chance in 1974 when they bulldozed to make a housing development). Of those 52 animals, ALL of them are male. And all, except one, are young ADOLESCENT males. Raleigh Philip, author of an educational neuroscience text, says, "It's interesting to speculate how the young Colombian Mammoths' adolescent brain may have led to their demise in the same way that teenagers take risks today." Devil's Tower (Wyoming) - Geologists agree that Devils Tower is the core of a volcano exposed after millions of years of erosion. However, there is still debate about the exact details of its formation. This bizarre land form has been somewhat of a mystery. 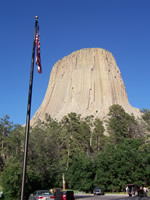 Perhaps that is why Stephen Spielberg used Devil's Tower as an alien communication point in his movie Close Encounters of the Third Kind. 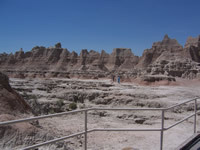 Also known as Bears Lodge, it is a sacred site for many American Indians. I personally like their legend the best. Beehive Geyser (Yellowstone Nat'l Park, Wyoming) - While Old Faithful is certainly the most famous geyser at Yellowstone, it is just one of the 10,000 geothermal features found in the park. The geyser in the picture is Beehive Geyser, an unpredictable cone geyser with water reaching 93 °C (199 °F) and eruptions up to 200 feet! 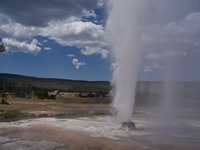 A cool thing about this geyser is that there is a small vent located a few feet east of Beehive, called Beehive's Indicator, which erupts about 6 feet, 10-20 minutes before an eruption. When we walked by the sputtering indicator, we decided to stick around for the show! Yellowstone Nat'l Park, (Wyoming) - Thermophiles, or microbes that live in extremely hot conditions, make up these colorful bacterial mats. Pigments (like chlorophyll and carotenoids) within the microbes are responsible for their colors. 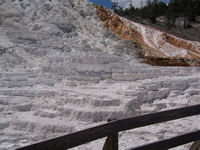 The run-off channel from a hot spring, for example, is white or clear near its source. This water is heated by the magma just under the earth's crust! 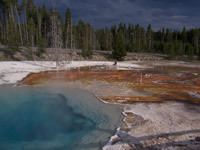 Only a few single-cell bacteria live in this boiling water, which is 93 °C (199°F). (Pure water boils at 212°F at sea level.) As the water slightly cools to 167°F farther downstream, the first colorful forms of bacteria show up. Shades of green to pink to orange to yellow-brown to gray indicate bacteria growing in slightly different temperature regions on the mat. Mud Pots! (Yellowstone Nat'l Park, Wyoming) - I was somewhat familiar with hot springs before my Yellowstone trip, but I was was never introduced to their close cousins, the fumarole and the mudpot. The mudpots quickly became my favorite geothermal feature, mostly due to their "bloop bloop" sounds. 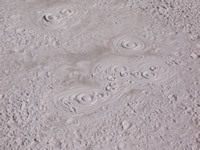 A mudpot or paint pot is a sort of hot spring or fumarole consisting of a pool of usually bubbling mud. Watch my Quicktime video to see a mudpot hurling mud into the air. Craters of the Moon (Idaho) - I saw fields of lava, both áa ("ay-ay") and pahoehoe ("pa-hoy-hoy") lava. (I liked the sound of those names!) The highlight of this visit had to be exploring the caves formed by the collapse of giant lava tubes. 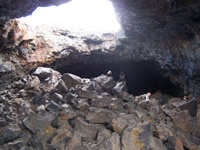 The tubes were originally formed as hot lava melted and rock in its path, while the surface of the lava in contact with the air hardened (forming the "roof" of the cave). When these tubes collapsed, they made great caves to explore! Finally, I couldn't resist... this picture is one of my favorites from the trip. 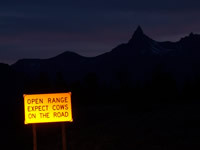 You don't see this in Chicago!